Hosted by the Dry Lakes Racers Australia (DLRA), the 28th Annual Speed Week competition was open to cars, motorcycles and trucks. The World Speed Trials, a first time event for motorcycles only, was held March 17-19. 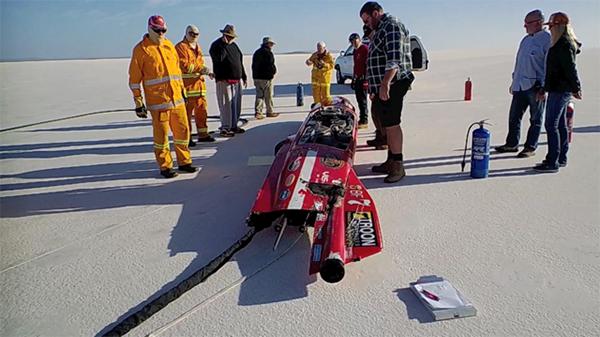 Thompson set a new streamliner record of 328.467 mph during the Speed Week competition on March 15, earning her membership in the Dry Lake Racers Australia 200 and 300 MPH Clubs. She is only the second competitor to gain membership in the DRLA 300 MPH Club and was honored with the “Fast Lady on the Lake” award. Thompson’s attempt to break the world’s overall fastest motorcycle record of 376.36 mph on the last day of the World Speed Trials went horribly wrong with a horrific crash. According to Federation Internationale de Motocyclisme (FIM) reports and team video, Thompson had just passed the four-mile marker on a 12-mile course when the rear of her streamliner rose off the racing surface, sending the vehicle airborne at 343.7 mph. Parachutes slowed the vehicle as it flipped and rolled multiple times, scattering wreckage for more than a mile across the Lake Gairdner salt flats. Thompson walked away with only minor bruises and lacerations.